I have a love/hate relationship with Twitter. It’s a great way to reach new audiences and connect with new friends. However, their rigid limits hinder your ability to introduce yourself to new people by “following” them. Worse yet, Twitter does not offer any tools to help you manage your account’s Followers and Followed. This becomes a real problem when you grow a large Twitter account. I was using a great little program called TwiPing until last year when Twitter removed it’s Whitelisting. Since then, I have accumulated over 1000 non-followers with virtually no way to clean my account. I was reading through some articles on TechCrunch and found a review of JustUnfollow. Similar to Twitter Karma, this website claims to clean-up your messy Twitter account. Unlike Twitter Karma, it claims to be quick … and actually work. I looked around for some other reviews/articles about JustUnfollow and I could only find positive comments. JustUnfollow celebrated its first anniversary with 210,000 users generating 58-million Unfollows! Not only does JustUnfollw work, but it’s quick and can handle large Twitter accounts too. You can use the service for free to unfollow 50 Followed but not Following Back. If you send a tweet about JustUnfollow, the amount is doubled to 100. But, for only $5, you can register for a Premium Account with unlimited clean-up for one Twitter account. (Twitter does still impose a 9999 change limit per day.) You can even Whitelist accounts to prevent accidentally deleting accounts that you want to continue following regardless. You will need to grant JustUnfollow access to your Twitter account. Once your account loads, you will have the Option to “Show Non-Followers” or “Show Fans”. By clicking the Show Non-Followers, JustUnfollow will quickly load the oldest non-followers first. Removing these accounts is as simple as clicking the Unfollow at the end of their row. If you want to also create a Whitelist, just click the Whitelist flag and you can quickly go row by row choosing to unfollow or whitelist each account. Following the Show Fans path, you can quickly review accounts that are following you but you are not following back. In a quick review of this list, I found mostly locked accounts that never accepted my “follow request”. JustUnfollow is a wonderful service that actually works. I cleaned up about 1000 unfollowers and created a Whitelist in less than 30-minutes. Now that’s impressive! 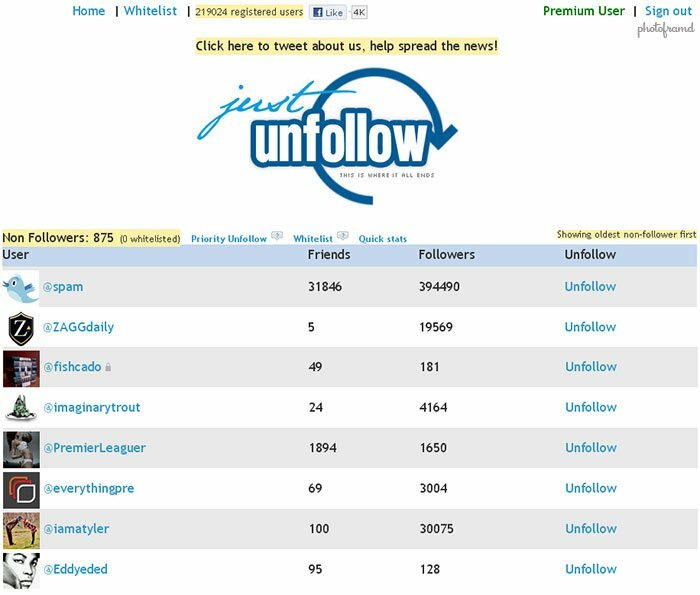 Like I tweeted yesterday, I am very impressed with JustUnfollow. Keep up the great work! If I had know that #Twitter had #SillyLimits – I would have been a wee bit more selective — more than I am currently. And I think a great feature would be to see activity levels – such as last tweet time and number of tweets. That way I could cull from the inactive accounts.